On Thursday March 5th 2009 I took the day off from work and drove north to Canada to see the Ives Ensemble. 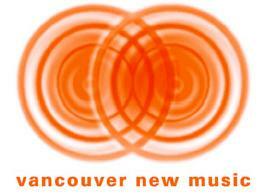 They’d been brought into Canada by Contiuum Contemporary Music for their SHIFT Festival of Canadian and Dutch music. Having a largish group flown in from the Netherlands for a festival seems a bit extravagant so working with various Canadian arts organizations they scheduled a few more dates across Canada. Vancouver New Music was one of these organizations and they managed to bring them to Vancouver as part of their Sonic Tonic series for the final date of their tour. One of the other members then chimed in to say that playing a piece many times is “Honest to the piece” and that it matures and you discover more. This sparked a question from the audience about which pieces tonight were particularly “well played” pieces and they answered that the Viola in my Life was but not the other Feldman, the Xenakis was a newer piece for them and obviously the the Cameron was being a commission. But the rest of them they had played many times, greater then ten times each. All in all a very interesting chat, very interesting to hear about the various experiences that working in an ensemble like this engenders. About a half an hour after the chat ended the concert began just a little but after 7pm. I had scored a seat front row center and the acoustics at this distance was pretty incredible, I could hear all the nuences of the instruments loud and clear. The first set began with Straight Lines in Broken Times composed by Christopher Fox. This piece is I believe what they call “post-minimalism”, in that it is made up of fragments of many different styles and was scored for piano, clarinet and violin. While segments of it were made up of almost Glass-like short repeated phrases others evoked classicism and still others evoked various folk traditions with one bit having a distinctly Klezmer-ish sound. The most interesting part of this piece was a section where the clarinet dropped out, then a couple of minutes later the violin leaving just solo piano for a few measures before they came back in. Not really my kind of thing, but it aptly demonstrated the skill and touch of the ensemble. They left the stage and then these three, plus a cellist came back out to play the first of four Postcards by Allison Cameron. This composition, Four Postcards, was designed to be played in as part of a program and each of them was stylistically diverse and only a couple of minutes long. I came to wonder if they were actually written for this specific program as they seemed stylistic informed by the other pieces. Like the Fox the first Postcard was rapid little fragments from the quartet, each of them working little independent rhythmic structures. There was very short violin solo in which it played longer tones in contrast to the rest of the piece. I wasn’t very taken by this piece either and I was becoming a bit depressed. Fortunately the Feldman piece that followed restored my spirits, though at around 8 minutes left me wanting. Four Instruments (1975) is scored for the same quartet as Feldmans final piece, Piano, Violin, Viola and Cello and has much of the same feel as that piece. It was amazing to watch the ensemble settle down, almost visible changing gears as shifted into Feldman mode. The vibrato was gone, the bow strokes flat and affectless, piano notes suspended. Really fantastic and when it ended so soon I felt a sense of loss. How I wish this set had been just a performance of Piano, Violin, Viola and Cello. This was followed by the second Postcard, which was very similar to the first, made of short little energetic fragments from the same line up of instruments. This time though there was a short piano solo as opposed to the violin, but like that it was less frenetic then the rest of the piece. The final piece of this set was Gerald Barry’s Piano Quartet nr. 1 scored for piano, violin, viola and ‘cello. This piece was incredibly frenetic, the only piece that had to have a page turner for the violist (primarily, also turned a page or two for the ‘cellist) and also the longest of this set. Frankly I didn’t enjoy it at all, it just seemed like an exercise in excess. Fast repeated, short sounds broken up by various, equally fast solo sections. There were a number of folk reference; an almost ragtime piano and the piece concluded with a very direct nod to Irish reels and jigs (though the ensemble didn’t really nail the trad ornamentation). The musicians didn’t seem to be enjoying themselves much as they played the piece, but this is one of the pieces they often play. There was followed by intermission, in which I had a cup of red wine and took a look at the CDs the ensemble had brought with them. Alas they didn’t have any of the hat[Now]ART CDs that are OOP, all the ones they had were readily available and were quite expensive. Shortly thereafter I was back in my seat for the second half of the concert which opened with the third Postcard. This was my favorite of the Postcards and the one were I began to suspect that these were tied to this specific program (or perhaps for the Ives Ensembles typical repertoire). It was for the same instruments with bass clarinet replacing the standard clarinet. It began with long mournful ‘cello lines that was then joined with longer tones from the bass clarinet. This piece had a much more Feldman-esque feel then the frantic insect-like nature of her earlier postcards. It wasn’t all long slow lines though, the piano added a nice bit of spiky counterpoint to these as did the ‘cellist at one point by plucking his strings. The Viola in My Life 2 followed and was by far the highlight of the evening. Once again the ensemble shifted into slow gear and once again displayed their incredible touch for this music. The violist was of course front and center, standing up for this piece, and was joined by the violin, clarinet, flute, percussionist and the pianist on celesta. It was fascinating to watch this piece, which I’m quite familiar with, unfold, the percussionist gentle shaking stuff in his hands at first then later gentle tapping a snare with his hands and occasionally bring out a few notes on the vibraphone. The celesta was rarely used, almost like another percussion instrument, adding a single ringing chord every so often to sublime effect. The viola of course was front and center with its mournful melodic phrase brought in again and again in various permutations. Really wonderful, again I longed for a whole evening of Feldman from this ensemble. This piece brought the greatest audience reaction including a spontaneous “Bravo!” from one of the members. The violist got an extra, well deserved, round of applause. The group returned for the final Postcard with the same lineup as the last but this time there were two additional performers carrying books and candles. They lit their candles and sat on the floor on either side of the musicians. After initial longer tones (the solo as it were) from the bass clarinet the group played short little fragments, but they were soft and sedate sort of in-between the styles of the first and third. These little segments were clearly to be played and repeated as long as the readers kept reading. They blew out their candles, first the reader on the right and then a minute or two later the reader on the left, as they finished whatever prescribed bit of reading they had to do and then the piece ended. This was my second favorite of the Postcards a really nice sounding piece with a clever bit of indeterminacy. The final piece was Plektó composed by Iannis Xenakis for flute, clarinet, piano, percussion, violin and ‘cello. I’ve heard a decent amount of Xenakis’s chamber works but this piece was new to me. Like a lot of his pieces it was pretty aggressive and bombastic. The percussion was a big floor tom, a huge bass drum and little tom-toms and these were heavily worked. The piano was also literally pounded and at one point there was a near call and response between the piano and drums. The other instruments created this swirling miasma of long tones often creating dissonance and almost beating tones between them. The piece was right on the edge I felt, a lot of the drum work was almost cheesy but the dissonances and the contrasts between the various elements kept my attention. It was definitely an exciting specticle to see live. This concluded the set and they ensemble left to much applause. Eventually waving away the appluse, John Snijders introduced the encore, Langzame Verjaardag (slow birthday) which was a piece written by Louis Andriessen for the groups 20th Anniversery. This piece featured all of the ensemble but Snijders who stood off to one side. He descibred the piece as a “canon in unison where each member can enter at will”. This piece was really nice, slow long tones, unfolding and overlapping and eventually fading away as each member finished their part. Eventually it was just the flautist who played three or four phrases before he to was done. A really nice ending to a great evening of music. Founded in 1986 by the Dutch pianist John Snijders, the internationally acclaimed Ives Ensemble consists of a steady pool of seven to fourteen musicians. The ensemble is well known for its performances of non-conducted 20th century chamber music, and in this rare Vancouver appearance will perform a program of works by Morton Feldman, Iannis Xenakis, Gerald Barry, Christopher Fox and Canadian composer Allison Cameron. This is one of my most anticipated concerts of the year, I never really thought I’d get a chance to see the Ives Ensemble live. Their performances of Feldman and Cage that have been released primarily on the HatART label have been my favorite versions of many of the pieces. Especially with Feldman their touch and interpretation has been impeccable. The program for night (found here on their website) has them performing Feldman’s Four Instruments and The Viola in my Life 2 along with Xenakis’ Plektó and three pieces from composers whose work I’m not familiar with. Of course I’d have loved an all Feldman programme, but any chance to see his music performed live, especially by such a fantastic ensemble is not to be missed. Feldman is rarely performed in the Pacific NW, but there has been more played in the last year then in the 10 before it. Last year I was able to see Dale Speicher perform The King of Denmark as part of a percussion recitial, a “Morton Feldman Marathon” at the Seattle Art Museum and Stephan Drury performing Palais de Mari along with an Rzewski piece. I can’t say how pleased I am to see the trend continue. Xenakis is rarely performed here as well so that is also a welcome addition to their programme. As for the three composers I’m not familiar with, well one always hopes for a new discovery. Gerald Barry, reading his Wikipedia entry, is from Ireland was a student of Stockhausen and Kagel and is praised for the “thematic development in his music”. Hard to glean much from that, perhaps the heavy thematic componants indicated he’s part of the neo-classicists, his relatively mainstream acceptance he seems to have could be further evidence of that. Christopher Fox who is perhaps more well known for his writing on music; I’ve read a few things of his but can’t recall hearing any of his music, seems equally hard to pin down. In his case its more that he dabbles in many areas so it depends on the piece played. Finally Canadian Allison Cameron, who also appears to work in a variety of formats and has been played quite a bit. On this site I was able to listen to some samples and while they were all too short to make much of an impression were intriguing. It should be interesting to hear works live from three composers new to me and I certainly am looking forward to the whole evening. Since this concert was on a Thursday, a three hour drive from here I decided to take a couple of days off from work and spend some time in Vancouver. Vancouver is probably my favorite city on the West Coast and I love to spend time there As I usually do I’m going to visit the Vancouver Art Gallery which has two exhibitions that look intriguing: How Soon is Now and Enacting Abstraction. The Vancouver Art Gallery is pretty unique in that it typically devotes each of its three floors to a single exhibition and there isn’t permanent galleries devoted to their collection. The exhibitions they put on are often made up from their collection along with borrowed works to allow you to really get a broader perspective on the topic. They do seem to do exhibitions such as Enacting Abstraction that are topically vague and allow them to leverage their collection. I’m always curious about current activities in art, so How Soon is Now with its focus on British Columbia artists is definitely intriguing. Along with these planned activities I’ll probably wander around some of Vancouver’s funky neighborhoods checking out the interesting bookstores, record shops and art galleries. If any readers know of any activities going on Friday or Saturday night that are must see let me know. This was the day of the performance so our workshop was technical setup and a full dress rehearsal of the piece. We brought down all of our gear from the seventh floor dance studio where we had been working up to this point and setup around the main floor. Marina had us setup throughout the floor and the tables and chair of the audience were mingled throughout. There was a larger core downstage but the ensemble was genuinely mingled amongst the audience. I was setup on the right hand side with a small table with my electronics and various tools. We ran through one page of the score before we had been wired up and I have to say that it was much more effective with us all spread around this much larger space compared to being packed in the practice room. It was much quieter, spare more like individual starts twinkling out a little burst of sound. We then move on to setting up of microphones and Marina’s turntable controlled computer setup. There was a lot of setup to get audio feeds from various musicians and to get Marina’s turntable and computer control setup running as she intended. This is an interesting setup as she has a record with MIDI time codes that she has a Max patch setup to allow here to move the audio feed around in the 8-channel surround sound system. After this point the had to setup the other performers and run through their rehearsal so I was off for four hours. The rehearsal was mainly practice for how we would enter the room and then we ran through the nights program. Marina and Giorgio had decided that we would play three segments of two pages of the score with the other pieces overlapping with each other. So it was to be a continuous night of performances with a single intermission. Marina setup a smaller subset of the ensemble to play initially, mostly electronics including myself. We played a couple of segments and then we were off till the performance. Considering the continuous nature of the nights performance the evening began with the artist chat. Marina first began discussing her previous projects where should would work with groups of untrained people to make music. Her basic approach is to engage with people first and musicians afterwards with an interest in disrupting the socio-economic musician/audience dichotomy. Asked about tonights piece she said that she found Atlas Eclipticalis to be a slippery object, the score itself reigns in musical techniques. It is a translation from one system, a star map, to human music making. Transformation and translation were essential concepts in thinking about the score for her especially as musicians typically think in time and not space. So it is the task of the interpreter to try to subvert their typical behavior, both with the use of their stereotyped techniques and in the form that music traditionally takes. After Giorgio’s introduction we filed in from back stage and took our places amongst the audience. The reduced ensemble began half way into the score on page three. As a participant it is pretty impossible to really describe the entire effect of the performance as I had to be focused on the score, my instruments and the conductor. 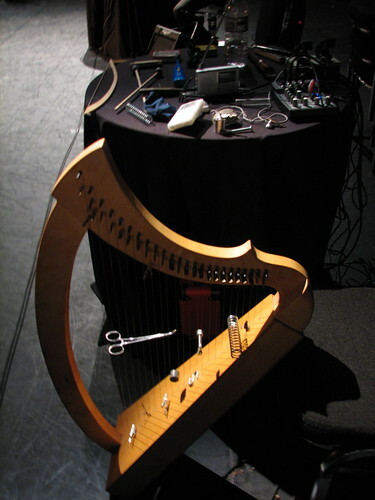 But overall I think this was pretty good, the small group included several electric guitars, laptop and myself with my prepared wire-strung harp, radio and iPod which was filled with samples of my own playing. Our sounds in general seemed to slip into the space and hover there creating the effect that I think Cage had called for. In the center of the room was a piano and as we came to the last half page Allen and Rebecca began playing Two4. Their playing was so restrained and quiet that they blending really well with us in a nice extended natural cross fade. As we dropped out their beautiful sounds took over. They really displayed how to take Cage at his instructions of playing as quiet as possible and without excessive technique. Almost no vibrato in Rebecca’s bowing and when it was used it was a dramatic effect. Allen’s restrained notes and chords would come out of nowhere and be fully suspended in the space, with long spaces between them. There were times where I’d see him press down on a key and hear nothing. This was absolutely stunning, one of my top three performances from the entire festival. As the end of their piece approached Giorgio stood up and our full ensemble started to play the beginning of the score. The full ensemble added a number of horns, reeds, percussion and voice to the mix. It was necessarily more dense at times, but how spread out we were in the room helped with that a bit. The audience had been encouraged to move around during the performance and occasionally people would move to the chairs to the right and left of my setup. Several people had moved to see the previous piece better and now they moved to different spots to see our ensemble in a different place. As we concluded the piece Randy, moved into his position in the audience toward the front of the room and began to place the beautiful haunting shÅ. Giorgio joined him with a conch shell filled with water that would add the occasional gurgle and glurp. The shÅ is a Japanese bamboo mouth organ, so it can do multiple notes ala a harmonica but its sound is more akin to the shakuhaci. A beautiful instrument and really well treated with Cage’s music. Like the earlier number piece this works with longer tones suspended in space. Interestingly contrasted when the conch shell would erupt with a burble, which of course was indeterminate. This piece was really nice and a quiet meditation to end the set. The second set began with a solo cello piece. This piece was interesting in that like Atlas Eclipticalis Cage used the star-charts of the Atlas Borealis for composing this work and for the cello part pitch, duration, articulation, color and dynamics are notated precisely for every sound. Very well executed this piece was, with a lot more intersecting sounds and rapid parts then most of what we were hearing that night. After this was a short solo Conch piece that again relied on water sloshing in the shell. So similar sounds as to its use earlier – the microphone picking up the gentle swells of the water moving around and the the occasional blurp or gurgle as the water enters and exits various chambers. This was follow up by a solo shÅ that was spare and haunting. This was just a section of the piece that can be two hours long and from its concluding strains we began the final section of Atlas Eclipticalis. This section I think was the poorest performance from our ensemble, too dense and too loud. It even got loud enough at one point that Marina motioned to us to tone down the volume. It wasn’t too bad, but after the other performances where you really had the sense of quiet, sparse sounds in space it was definitely a bit much. The second piece from Allen and Rebecca was the final piece of music that John Cage wrote. Very much akin to the earlier piece they had played this one was equally wonderful. It seem to have a bit more denser sections a few more chords and parts where the violin and piano could overlap. The number pieces are made up of time brackets within which the performers can choose when to play so there are subtle timing differences between every performances and periods where these overlaps can only occur if simultaneous choices are made. Of course between the notes is a lot of space, space to contemplate the notes and to hear that music that occurs when no-one is playing. Again they played with incredible restraint, and a wonderful lightness of touch. A few minutes before the conclusion Marina stood up and began to use her turntables and laptops in an interpretation of the same piece. This really didn’t seem to bear much resemblance to the piece that we had just heard, what with rumbles, static and samples being the material that she used. There was some sample piano that I wonder if it was from a recording of this piece or just in acknowledgment of the appropriate instrumentation. Overall this came across to me as more of an structure improvisation of an electro-acoustic nature. It may have owed a lot to this composition by Cage, but came across more as an acknowledgment of his ideas – using the detritus of our culture as sounds, emulation of random radio dial spins, perhaps some indeterminate elements. It did miss out completely on the spaciousness of this piece and the silence that is so essential in Cage’s work and was clearly present in this piece. Still an energetic and lively conclusion to an amazing four days of music. Marina had had airline troubles and was running a bit late, so Giorgio had us run through a page of the score whilst we waited. Marina came in during this and watched as we completed the page. Giorgio introduced her to us and she regaled us with some of her thoughts on the score. Since she had been asked to run this ensemble she had spent several months examining and thinking about the score. Trying to deal with it in terms of space – both outer space and in a musical sense. The circular aspect as well – with the clock’s and positioning the score in that frame of reference was another issue, on that she decided to work with by moving our sound around in the space. This she was to do with a specially formulated record that had MIDI time codes on it and a Max patch that would take those signals and use them for audio routing. So she would be adding additional circles – that of the turntable and the sound field. As for our interpretation so far she felt that we could be even slower, that we should avoid “extraordinary sounds” (as per the instructions) and to try to play as inexpressive as possible. Simple quiet sounds with as short a duration as possible unless indicated otherwise. She was very interested in the intersecting sounds and felt that we should do these as much as possible. Melody she said should be on the edge of possibility, never deliberate but create by chance from the simple events that were performed. She then went around the room and worked with every one individually for 10 minutes or so testing their approach and offering advice. These Variations were originally done with the Merce Cunningham dance company whose very movements would interfere with various electronic devices. For this performance they followed this and had four dancers moving about the central space. There was a lot of mvideo setup for this one from a TV on the left hand side with a live camera positioned above it to the central projection video of a previously recorded film of these same dancers. The sounds used were a lot of radio, who were interfered by the dancers, and also other electronics that I believe they had various other triggers, including the aforementioned camera/TV setup. These electronics were in the synthesized low tone range a lot of the times in emulation of the Theremin type machines that were used in the original. The dancers however were most definitely not the Merce Cunnigham dancer company and most of their prancing and moving around the space was an embarrassment to watch.. They would run around, and “play” with each other and a giant white ball, grapple with each other and often run in front of the video camera. The projected video was pretty cheesy – two of the dancers rolling around on each other primarily, with cross-faded close-ups and the like. This was the weakest of the Variations in my opinion and I think it was solely because of the dancers, as the sounds were interesting but their shape was dependent on these dancers. Margaret arrived late to her chat, just as Gordon Mumma was being drafted to fill in. Margeret began by explaining that the program that she was to play had been chosen so as to cover the entire range of Cage’s piano work – traditional piano, to the prepared piano, to the toy piano. Gordon asked her about the Chess pieces, which were to receive their Canadian premier tonight, and she explained that this was a score where there were notes on each square of the chessboard. This chessboard had long been in a private collection and on finding Cage’s notes about it, it was sought out and she reconstructed the piece from it. Asked about the Black Mountain College days of Cage, she pointed out that this was the period just before Cage had moved into the chance operations. While he had thought up the concept for the so called “silent piece” several years prior it was his exposure to Rauschenberg’s “white paintings” at this time that gave him the “courage” to compose it. She also explained that she had plained to end the program with “Water Music” which apparently has a lot of radio work in it, but that she couldn’t tune anything but static in, down in the main room (a bit odd considering how much radio we’ve already heard, though perhaps the score called for shortwave which I personally had no success in tuning in during the Treatise performance). This led her to an amusing anecdote about the microphones on her piano picking up an Emmylou Harrison soundcheck during a performance of the Sonata’s and Interludes. This piece by Cage was commission for the American Bicentennial and was very controversial in its premiere. In homage to this VNM decided to have it performed by Canadian citizens who were formerly Americans. The piece is twelve people simultaneously reading from excerpts from the writings of Henry David Thoreau. The twelve men, some of them clearly of draft dodger vintage, were arrayed at podiums in front of the audience and each read from their texts in wildly different styles. At several points each of them would take out a small instrument and plonk away at it, in various degrees of musicality. The volumes of their mic’s were being adjusted as well, as per the score I assume. Samples of weather sounds; rain, thunder, wind were played a various times during the readings and toward the end there were various simple geometric shapes projected on the big screen.. I personally found this piece wonderful and very charming, the voices overlapping often incomprehensible and at other times one voice dominating and coming through clearly. Plus I am a huge fan of Thoreau and I delighted in hearing his writings brought to life in a way that I think would have made him chuckle for days to come. Not so the other people at my table who walked out after 30 minutes or so, leaving their companion who relied on crutches behind. At the end of the show she asked me how I felt about it, and somewhat surprised about this question I said it had made me happy (though delight would have been a better term). She informed me that it had made her sad and then hobbled away. “Fontana Mix consists of a total of 20 pages of graphic materials: ten pages covered with six curved lines each, and ten sheets of transparent film covered with randomly-placed points. In accordance with a specific system, and using the intersecting points of a raster screen, two of the pages produce connecting lines and measurements that can be freely assigned to musical occurrences such as volume, tone color, and pitch. The interpreter no longer finds a score in the customary sense, but rather a treatment manual for the notation of a composition.” – from here. Matt Rogalsky created this piece for a performance of different interpretations of the Cage piece, Fontana Mix. For his version there are a number of computers networked together and a pool of samples that make up the piece. They use chance operations to setup up guidelines for the performance of the samples and there is a bit of control from the performers as to how they are played, including where in the sound space they were placed. The performers were three brothers with Powerbooks on a single table in front of the stage with some abstract visualization made up of parts of the score behind them on the big screen. The sounds utilized included quiet scraping sounds, to almost bird like twittering sounds, to the sounds of a rubbed cartridge or contact mic to various pops, clicks and hisses. There was some super sparse sections, some genuine silences and some really busy parts that would sometimes whip around you as they moved the samples around the sound field. The information about the piece that I mentioned above was all gleaned from this chat. They passed around the room the transparencies and the pages of squiggles and dots that were used to generate the scores for each of the performers. The end result of this procedure is a series of events in time. The software utilized was Supercollider and Matt Rogalsky had generated the scores and developed the software setup. He had created this for a festival in Berlin that had eight different musicians each doing a different take on this piece. He said that each of the musicians/composers would take this piece and still end up sounding like themselves, Christian and James Tenney being two of the other composers that he mentioned participating (This seems to be the festival program though it is in German only). The performers of this networked version had a specific duration of twenty-five minutes, utilized a shared score and a pool of the samples – they could trigger a sample that was already in use for instance. The software gave each of the sounds movement in space using a drunkards walk, but they as performers had control over their speed. The final performance of this night was Margaret Leng Tan on piano, prepared piano and toy piano. She played the above pieces sequentially from the date of compositions. She with Bacchanale which used the prepared piano and was real vigorous and fully worked the percussive nature of this instrument. Next was the Suite for Toy Piano which was very plinky and you could really hear the sound of the toy piano’s action. This piece was mostly single notes, little runs and short spaces. DreamSeasons was next, and while I give Cage full credit for evoking each season quite clearly I find the piece pretty boring overall. It is mostly made up of short repeated phrases that were sparser and spikier in fall, more dissonant and quiet in winter, sprightly in spring and sedate in the summer. Well crafted but not something I’d want to hear often. Chess Pieces included the score unfolding on the video display square by square as she played the piece and also Gordon Mumma onstage to turn pages. The music was pretty dense with a fairly rapid tempo. Each row of the chessboard was treated as a musical phrase with a short pause at the end. Margaret chose to perform 4’33″ on the toy piano which was an excellent choice. The audience was treated to the sound of new music fans trying desperately to be quiet and even though Margaret had announced at the beginning that we could turn cell phones back on, alas none went off. She went directly from this piece to Etudes Australes which is a piece in the same series as the Atlas Eclipicalis that I was involved with. This also had the score projected and was a sparse, pointillistic affair. The notes seemed be primarily in the upper ranges of the piano and would be in short clusters punctuated by silences. Not really to dissimilar to a way one could play Atlas Eclipicalis. The final piece In the Name of the Holocaust is a powerful moving piece that closed this evening on a fairly somber note. The insides of the piano were played in a fairly continuous fashion for some time and then she moved to deep chords and then both chords and inside work. An almost koto like feeling was evoked creating a deliberate and clear contrast – Japanese music and bombing chords. The sustain held on, dense layers of sound build up which are then punctuated by sharp plucking, followed with pounding and rattley sounds that become sparser and sparser and then it ends by a huge smashed chord. While I certainly prefer John Tilbury for my New Music Piano, Margaret Leng Tan is a consummate performer who worked closely with Cage and has performed it extensively. I loved seeing her perform and enjoyed the wide range of pieces she worked through. While a lot of the earlier Cage is not to my liking it was valuable to get a chance to hear it performed. A Spiral Cage is powered by	WordPress 4.6.14 and delivered to you in 0.337 seconds using 22 queries.